When Ron rescued a small bird running desperately for its life from a crow, little did he know how much joy and learning the day would bring. The full story is in our blog A Lucky Rescue Makes A Happy Family and in the pictures below. 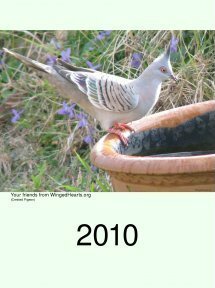 All subscribers to the free Wild Bird Talking Ezine will receive this free gift for 2010. These are 13 full resolution pictures which you can view on your screen or print as a desktop calendar or wall calendar. Printed on photo paper, it makes a beautiful gift to delight all through the coming year. 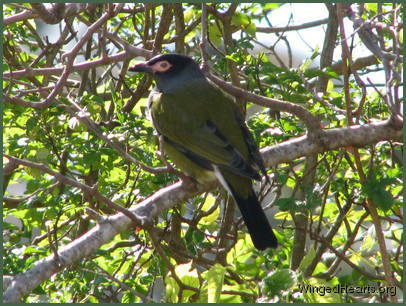 Figbirds follow the fruit trail and drop in for a few weeks each year at the start of the mulberry season. Well camouflaged by their plumage these birds are hard to spot as they help themselves to the fresh pickings. 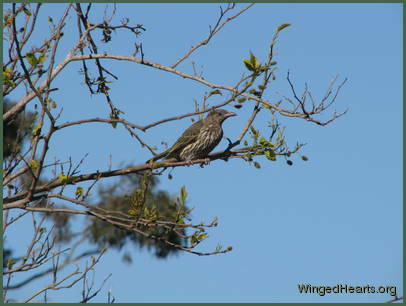 Bell-miners are closely related to their cousins the noisy-miners and the blue-faced honeyeaters, but they seldom visit our yard.